What is the Double Declining Balance Depreciation Method? The double declining balance depreciation method is a form of accelerated depreciationDepreciation MethodsThe most common types of depreciation methods include straight-line, double declining balance, units of production, and sum of years digits. There are various formulas for calculating depreciation of an asset that doubles the regular declining balance approach. It is frequently used to depreciate fixed assetsTypes of AssetsCommon types of assets include: current, non-current, physical, intangible, operating and non-operating. Correctly identifying and classifying the types of assets is critical to the survival of a company, specifically its solvency and risk. An asset is a resource controlled by a company which future economic benefit more heavily in the early years, which allows the company to defer income taxesAccounting For Income TaxesIncome taxes and its accounting is a key area of corporate finance. Having a conceptual understanding of accounting for income taxes will allow a company to to maintain financial flexibility. Tax is an intricate field to navigate and often confuses even the most skilled analysts. to later years. This guide will explain how it works and provide examples. Let’s examine the steps that need to be taken to calculate this form of accelerated depreciation. Obtain the beginning book value of the asset (i.e. $1,200,000). Determine the useful life of the asset (i.e. 5 years). Determine the salvage valueSalvage ValueSalvage value is the estimated amount that an asset is worth at the end of its useful life. Salvage value is also known as scrap value or residual value, and is used in calculating depreciation expense. The value depends on how long the company expects to use the asset and how hard the asset is used. For example, if a of the asset (i.e. $200,000). Deduct the salvage value from the from the beginning book value to determine the total depreciable amount for the life of the asset (i.e. $1,200,000 – $100,000 = $1,100,000). Calculate the annual depreciation rate (i.e. 100% / 5 years = 20%). Multiply the beginning period book value by the twice the regular annual rate (i.e. $1,200,000 x 40% = $480,000). Deduce the annual depreciation expense from the beginning period value to calculate the ending period value. Repeat the above steps until the salvage value is reached. 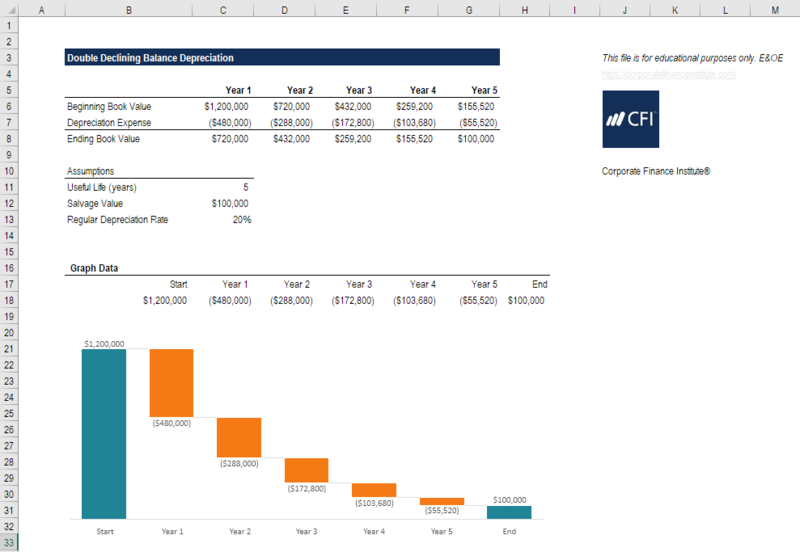 Using the steps outlined above, let’s walk through an example of how to build a table that calculates the full depreciation schedule over the life of the asset. Look at the screenshot below and then read the explanation of how it works. As you can see in the Excel analysis, a few key assumptions have to be made, and from there, an analyst can build the full schedule. The extra piece that’s added here is that in year 5, only the difference between the opening value and salvage value should be expensed. If more than that were expensed, the closing value would go below the salvage value. 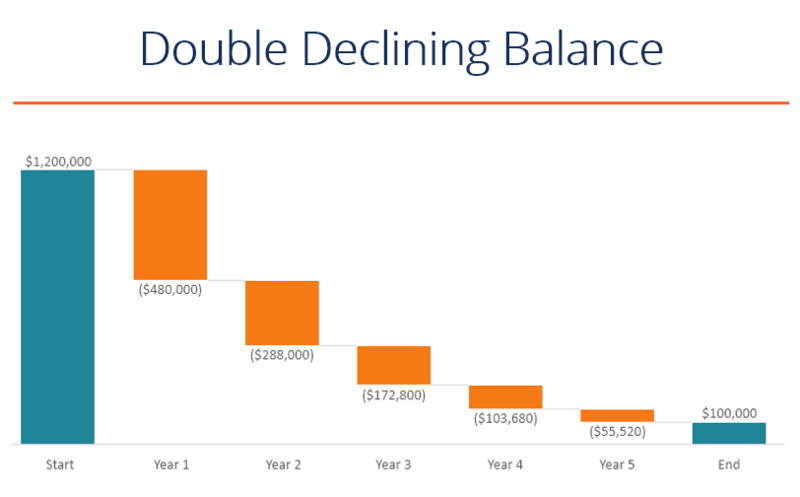 Download the free Excel double declining balance template to play with the numbers and calculate double declining balance depreciation expense on your own! The best way to understand how it works is to use your own numbers and try building the schedule yourself. By accelerating the depreciation method and incurring a larger expense in earlier years and a smaller expense in later years, taxes are pushed out. Let’s look at an example below of how this works. Continuing with the same numbers as the example above, in year 1 the company would have depreciation of $480,000 under the accelerated approach, but only $240,000 under the normal declining balance approach. In year 5, however, the balance would shift and the accelerated approach would have only $55,520 of depreciation, while the non-accelerated approach would have a higher number. The total expense over the life of the asset will be the same under both approaches. The only difference is the timing of the expense. Since depreciation is tax deductible (it lowers a company’s net income), the company pays fewer taxes in the early years and higher taxes in the later years with the double declining balance method. There are various alternative methods that can be used for calculating a company’s annual depreciation expense. Essentially, companies can use whatever method they please, provided they offer some explanation for why they use that method. Companies will typically keep two sets of books (two sets of financial statements) – one for tax filings, and one for investors. Companies can (and do) use different depreciation methods for each set of books. For tax purposes, they want the expense to be high (to lower taxes) and for investors, they want deprecation to be low (to show higher profits). Thank you for reading this guide to the strategies behind the double declining balance depreciation method.